355-096 Designing Education for the Web - Do We Understand the Basics of Representing Information Effectively? 355-181 Learning Objects: Raising Standards or Raising Questions? 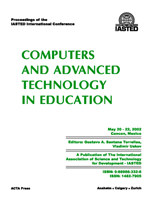 This publication covers the following topics: Collaborative Systems, Projects, and Web-based Learning; Computer-Assisted Learning and Instruction; Curriculum Design and Development; Institutional Issues and Special Educational Requirements; Internet-based Educational and Training Systems; Effectiveness, Quality Control, and Professional Development; Models, Tools, and Software Programs; Virtual Reality and Online Education; Database, Multimedia, and Communications Technology; Knowledge Management for e-Learning; and Network and Distributed Computing Technologies in e-Education.